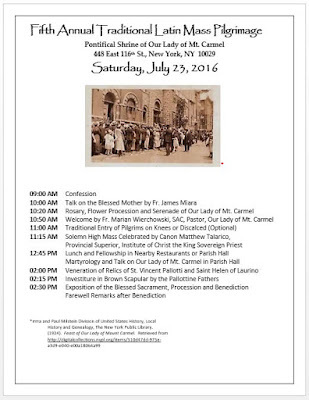 On Saturday, July 23rd, at 11:15 a.m., a Solemn High Traditional Latin Mass will be celebrated in the Pontifical Sanctuary of Our Lady of Mount Carmel in East Harlem, New York, at the privileged altar of the Crowned Madonna, for the fifth annual pilgrimage being made that day by faithful attached to the Extraordinary Form of the Latin Rite. Services held throughout the day for the pilgrims; Rev. Canon Matthew Talarico of the Institute of Christ the King will be celebrant of the Mass. There is ample parking in the gentrifying neighborhood and the church is very easily accessible via public transportation. There have been several documented miracles been performed by the Blessed Mother at this shrine. The image located there was proclaimed miraculous by His Holiness Pope Leo XIII, and crowned during the pontificate of Pope St. Pius X on July 10th, 1904. There are only three images of the Blessed Virgin that have been crowned by Pontifical Authority in North America. The image has been recently restored. The Pontifical Sanctuary of Our Lady of Mount Carmel, at 115th Street is one of the first Italian national parishes in the United States. At one time, more than 500,000 people attended the feast of Our Lady of Mount Carmel during the month of July before and after the feast day on July 16th. The crown of the Madonna and child is gold, adorned with precious stones, the emerald of which was donated by the aforementioned pope. The Crowned Statue is taken down in procession only on special occasions and with the authorization of ecclesiastical authority.